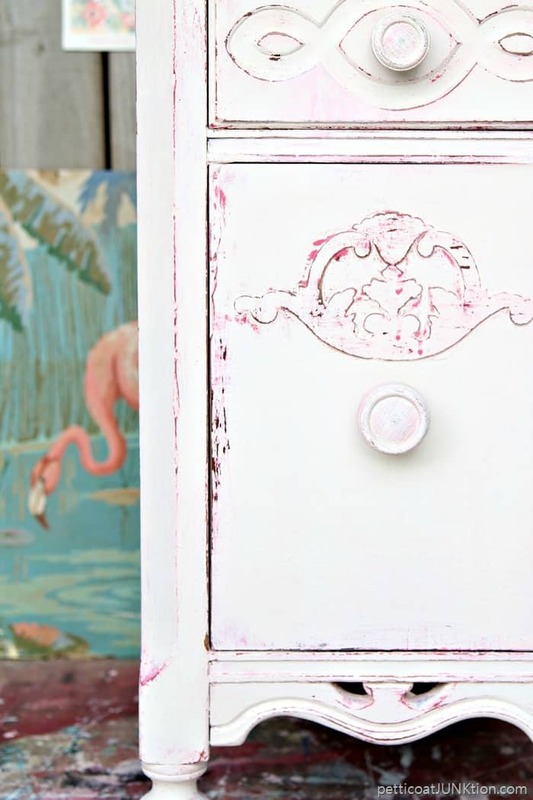 Do you guys remember the days when shabby chic pink and white decor was all the rage? I do, but I forgot how much I love the look. 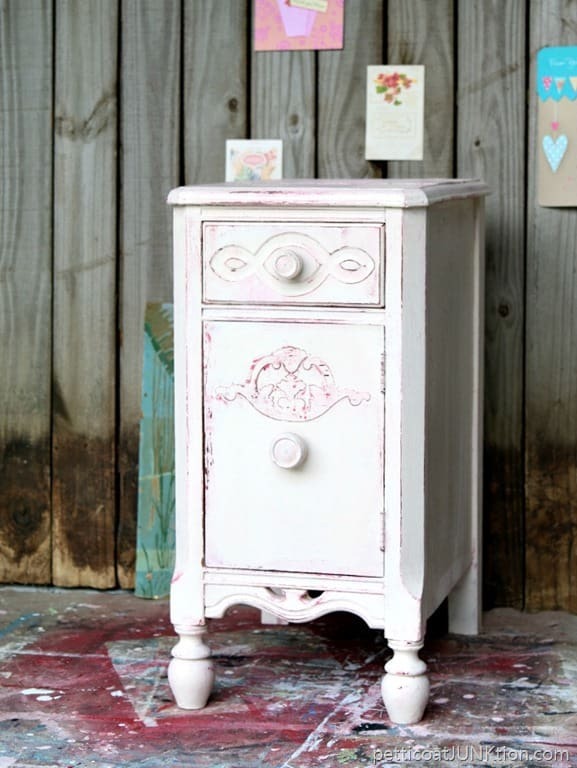 Working on this project and seeing the results reminded me how pretty shabby chic can be. Today is themed furniture day and the theme is “layered”, meaning layered paint. For the theme I layered off-white paint over pink paint and I’m in love. Patting myself on the back. You know I do that sometimes. The piece I choose for the makeover is perfect for layered paint. Look at all those gorgeous details. I bought the nightstand/end table/ whatever you want it to be, at My Favorite Junk Shop for ten dollars. Does it look a little odd to you? That’s because it’s one half…or less…of a vintage vanity.The peeling veneer and missing hardware didn’t scare me off at all. I knew at first sight that it would be a shabby chic stunner. The beautiful decorative detail on the vanity door was still intact. Win-Win. Usually the wood appliques are in pieces. The knobs I decided on for the makeover were salvaged from the white-washed coral chest of drawers I painted earlier this year. The knobs work well because they don’t over shadow the pretty wood details. And how about the little curvy detail on the bottom?? I made a video of the whole process. The best way to learn. 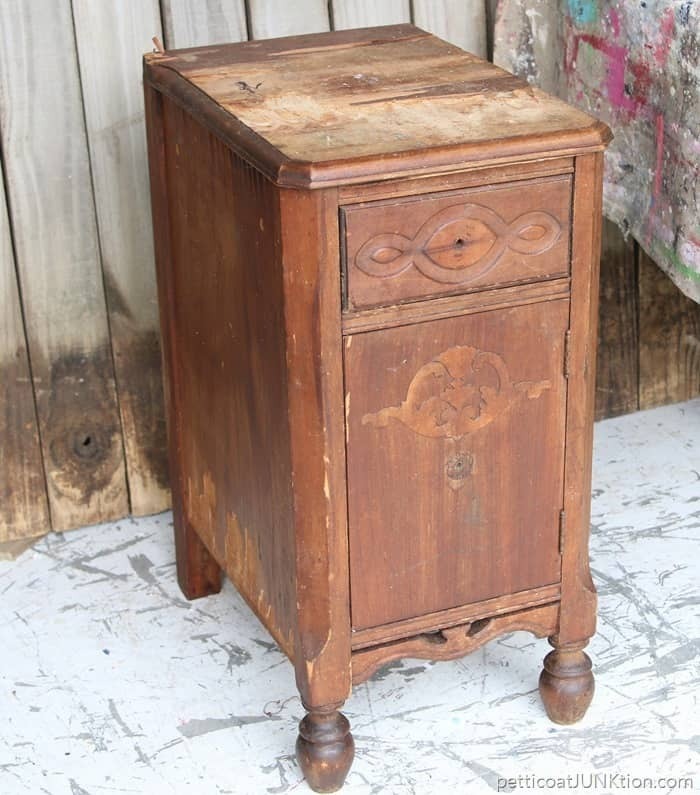 See the video below…..
Now it’s time to take the “layered” tour. The DIY Furniture Girls project photos are below. Just click the photos to see the complete makeover. I’ll see you guys next week. Have a great weekend. This is gorgeous! Wish I could find one like this, great job!! I almost think this would have looked better in a different color than white. It’s a bit too washed out. This is gorgeous. What a beautiful transformation. love the color too. I would love if you shared this at our link party on Sunday @ 4:00 EST, Dishing It & Digging It. Beautiful! 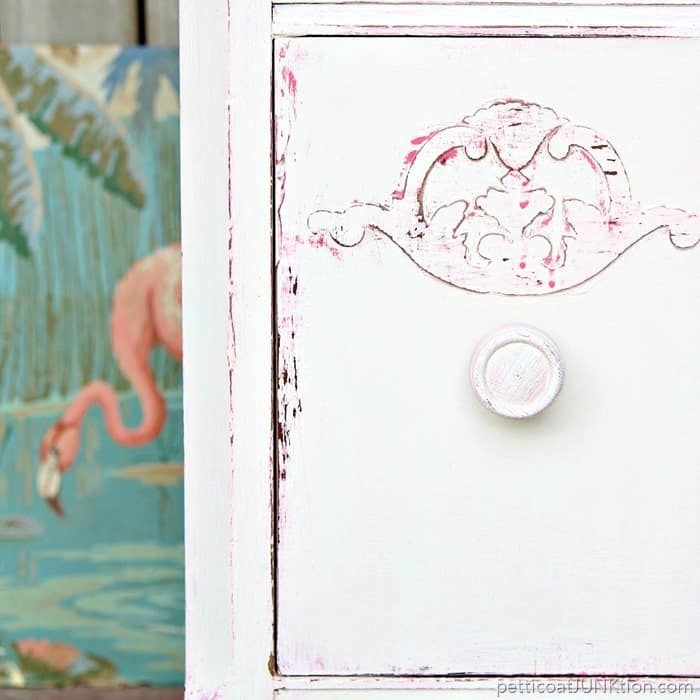 I have always loved the layering effect using pink and white. It always makes me think I am decorating a little girl’s room. It looks so delicate and feminine. I want your vanity. Its beautiful. 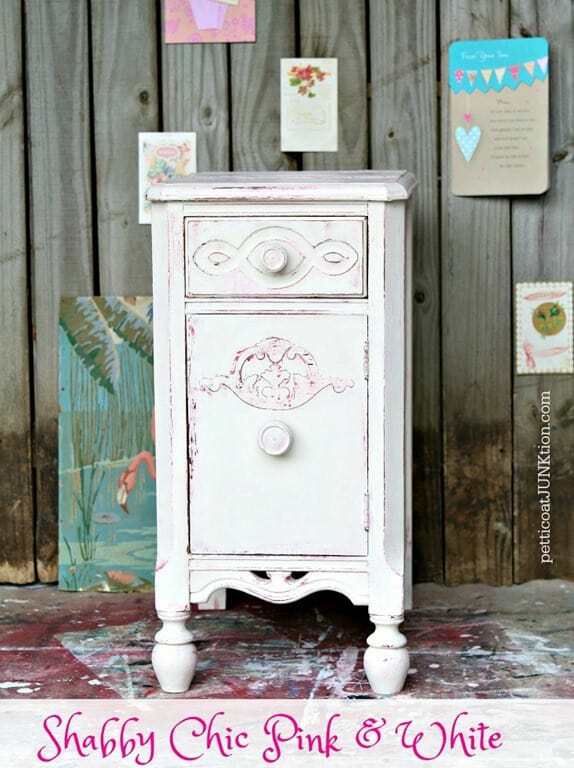 You layered the paint and finish on just right to make this part of a vanity shine. Gorgeous! 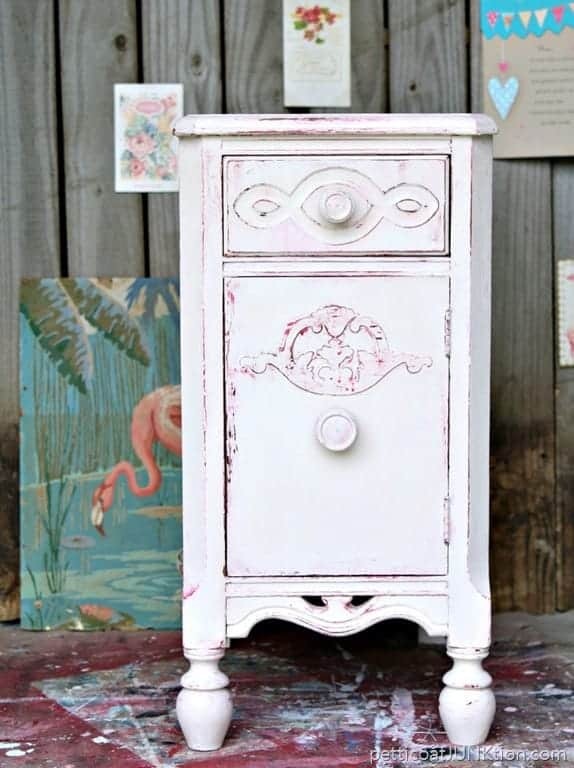 I love the details of this piece and the pink paint peeking out from under the white really brings them out. Lovely update! I love the nightstand’s new look! Beautiful color choices! I always say this, but it’s so true — I can’t believe that’s the same piece! What a beautiful transformation. I like the slight peek-a-boo of pink as not so overwhelming. Kathy, the pink poking through makes all the difference! What a happy piece! This is so sweet! I love the color you chose! Beautiful! Is your flamingo picture for sale? I love all your posts! You are a creative genius.